If you are wondering what exactly it is we here at Bradburys do, you have come to the right place. Below you can read more about Bradburys, the areas we focus on and the events we attend. …to be the most inspiring cheese business in the world. …inspiring customers and consumers with our passion for cheese. …creating and delivering innovative solutions. …managing complexity and delivering simplicity. …creating strategic partnerships with our supply base and customers. 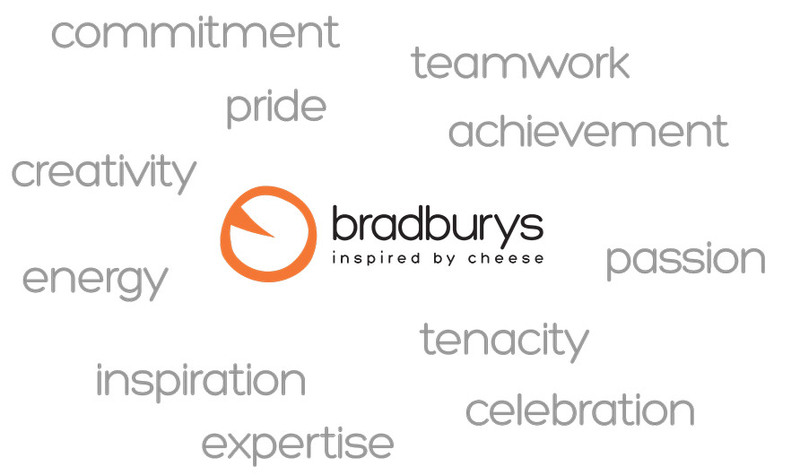 Bradburys was founded in 1884 and we’re proud of that heritage, of our long standing traditions, family values and ‘can do’ attitude that runs through our knowledgeable and passionate workforce. That knowledge and commitment to quality, right across our business, combined with the strength of our partnerships with supply partners in the UK and Europe, ensures we continue to supply major retailers, wholesale and food service companies in the UK as well as a fast growing export market. We’re a modern-thinking and innovative company, continually responding to consumer demands, driving technical innovation across our business, managing complexities of the supply chain efficiently to deliver simplicity and good value for our customers.